Choose our sleek and easy-to-manage faucet. A modern look with a single lever handle. Faucet is constructed of a solid brass body for enhanced finish and performance. This piece from Delta brings a modern look to many kinds of bathroom styles. This classic single-control faucet is easy to match a lot of bathroom looks. Add more beauty to your bathroom with this item's easy-to-install, deck mounted design. Save water and get the same clean with this WaterSense certified faucet. Balanced and poised, Essence S-Size Lavatory Centerset studies the purity of the cylindrical form - reflecting the modern styling of Cosmopolitan interiors. Its fluid profile uses balanced, modern styling and creates space for inventive furnishing ideas and innovative technologies. By combining superior technology with a choice of breath-taking designs, GROHE can provide you with all the elements to enhance your bathing space. The modern favorite. Mixing cutting-edge, space-conscious design with trusted GROHE performance, the new Eurosmart Cosmopolitan collection is a stylish, sleek and streamlined choice for the modern bath. Eurosmart Cosmopolitan Lavatory Centerset offers unparalleled purity of design with dynamic architectural formation. This faucet will transform a bathroom into a modern oasis of function and style. The contrasting design combination of 900 angles and curved accents evoke a sense of both excitement and calm. Complete your bathroom with this new, all-around useful piece from Kingston Brass. This dual-control faucet adds a classy look to any bathroom project. Its deck mounted design fits with many sinks and isn't hard to install. This faucet is WaterSense certified so you use less water to get clean and help the environment. 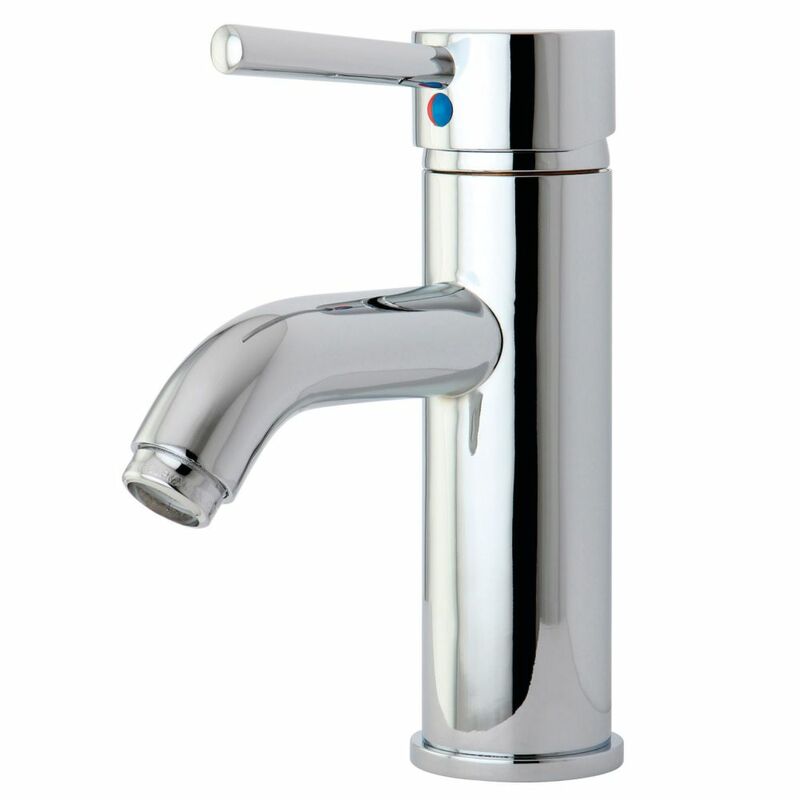 Contemporary Single Hole Single-Handle High-Arc Bathroom Faucet in Chrome Choose our sleek and easy-to-manage faucet. A modern look with a single lever handle. Faucet is constructed of a solid brass body for enhanced finish and performance. Contemporary Single Hole Single-Handle High-Arc Bathroom Faucet in Chrome is rated 4.2 out of 5 by 34. Rated 5 out of 5 by Bobbiann from The faucet has performed well and is ideal for my updated, espresso-colored sink cabinet, which h... The faucet has performed well and is ideal for my updated, espresso-colored sink cabinet, which has a thick "green" glass top that is suspended above the cabinet. I'm very pleased. Rated 1 out of 5 by missy from Although I love the high STYLE of this faucet, the chrome finish has already deteriorated with ti... Although I love the high STYLE of this faucet, the chrome finish has already deteriorated with tiny bubbles that mar the highly polished finish. Just a matter of time before the chrome flakes and there is no way to repair. All the chrome faucets I put in this old house, REGARDLESS of manufacturer, are all looking bad at 3 years out while the one nickel faucet that is a year older than the chrome ones, is still as beautiful as the day installed. Rated 5 out of 5 by SunDog from Very nice single handle faucet. Just be sure your vanity has only 1 hole (even the tiny vanities... Very nice single handle faucet. Just be sure your vanity has only 1 hole (even the tiny vanities now how 3 holes). It is has become extremely hard to find a base plate to cover the other 2 hole in order to allow one to use this single hole faucet. Rated 2 out of 5 by JC from It leaked right out the box from top handle I Bought 3 of them not problem with exchange but I ca... It leaked right out the box from top handle I Bought 3 of them not problem with exchange but I can't really rate this faucet will see later on with use. Rated 5 out of 5 by Reader from The faucet is attractive and functional. We especially like the single handle operation. The faucet is attractive and functional. We especially like the single handle operation. Rated 1 out of 5 by Cynthia from my plumber has been so frustrated installing this! i think... my plumber has been so frustrated installing this! i think it is from Great Britain so it is not a standard size for America. Plumber had to special order something to get it to fit our pipes. Still leaks, what a joke. Don't buy!! !